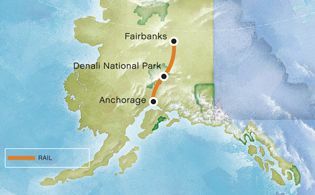 Experience the Alaska Railroad route from Anchorage to Denali National Park in one of our premium, glass-domed railcars. This Rail-Only option includes rail transportation only. This does not include hotel accommodations or transfers (transportation) to/from the depot and does not include transfers (transportation) to/from hotels in Denali.